I replaced my seven-year-old Time Capsule with a new one last week. Can I erase the old one and connect it by ethernet occasionally to serve as a second backup kept off premises? Or would I be better off with just a flash drive for important files? The networked Time Capsule base station/backup combo doesn’t have a great track record for long-term survival. I’m surprised it’s lasted seven years, and you might not want to push your luck with it. At a minimum, you’d want to wipe its network settings so that it doesn’t confuse your existing devices into which base station is which. Then you can just plug it in as needed. 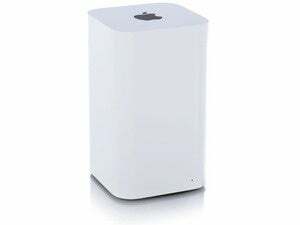 A better solution for a secondary backup you can rotate out is a portable hard drive connected either to a Mac on the network or a Wi-Fi router from someone other than Apple that supports USB 3.0 drive connections and is Time Machine compatible. You can get terabytes of storage in a portable hard drive format with a USB 3.0 connection for relatively little: a Western Digital portable USB 3.0 drive runs from $60 for 1TB to $120 for 4TB. NetGear’s AC1750 (model R6400) shares USB drives in a way that works with Time Machine. With either of those options, you set the drive as a Time Machine target, and choose it from all your Macs on the network. When you’re confident the backup is complete, you can eject it or unmount it from the base station and take it off site. Time Machine on each Mac should keep backing up to your new Time Capsule.